How often do we give our children inappropriate materials. In reality it probably doesn't do too much harm, but it doesn't do any good either. Beginning Montessori state 'Most rattles are so big they look like a bar bell when offered to an infant' and I think they are right. Otis is still little (9 weeks) and this sweet little bell rattle fits perfectly in his hands. It is seriously the sweetest 'toy' for an infant and so, so simple. It is the only hand material that he is using (the others in the above picture are a little big for him to get his fingers around and are to be used at around three months). While it stimulates his grasping reflex it also allows him to focus and concentrate on tracking (as he looks at it) and works on making purposeful movement. It also gives him something else to do and something new to explore. I know that he enjoys it as he will grasp it and shake it for a few minutes at a time. Yes, building up hand strength too. It truly is the simple and most natural (and handmade) things that are the best. 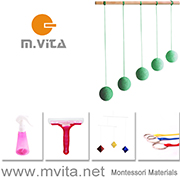 Montessori mentions the need to follow the natural rhythm of the child and to meet the child's natural needs. I think this is especially important for feeding and sleeping. providing safe, warm, comfortable environments for him to sleep. Fortunately feeding Otis is simple, he is always with me, he feeds well and is growing well. For sleeping we provide lots of areas within the home for him to rest and sleep. A soft blanket or a lamb's wool is perfect for this. Then as we play or work he can drift in and out of sleep as he needs and we can move it around. This is a great way of keeping him involved in our family life. If I see him getting sleepy I do put him in his bed, but it's ok if it doesn't always work out. We are not actively putting him to sleep but rather he chooses when to sleep. He is also learning to sleep independently. Luckily following the post Sleep. Day versus Night he has two consecutive long sleeps at night, only broken by a feed. Although we don't use them intentionally we have also found a car drive and his mobiles work well. Here is a favourite photo of mine from a couple of weeks ago, Otis sleeping under the Octahedron. As Otis (8 weeks) really enjoys batting his Gobbi mobile, today I put up his bell on a ribbon. I hung the bell from a ceiling hook in our lounge area. At the end of the ribbon there is some elastic so when he is ready to grasp the bell it has some give in it. We purchased the bell on a ribbon from Goose Designs. His batting (and kicking) at the moment is accidental. He is only just making the connection that he is hitting the bell which is making the sound. Soon this will become intentional movement and he will know that he has control over his environment, he hits the bell and it make a noise. I believe this can be very empowering for a child to set out to do something (hit the bell) and then to actually achieve it (and cause it to ring). How rewarding! The bell on a ribbon is like most mobiles, great for developing tracking and concentration but as this one is intended to be hit it is also great for developing coordination and learning about cause and effect. 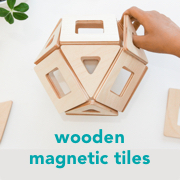 Montessori emphasised being aware of the child's skill level and offering an environment that is supportive of the child but also challenges the child. This mobile is on the edge of Otis's skill level and is a definite challenge for him. Last night I noticed Otis batting at his Octahedron Mobile. It reminded me that he has just turned eight weeks old and perhaps it was time to introduce the Gobbi. We have been encouraged to change the mobiles regularly around every two weeks as each mobile has it's own unique benefit and to prevent the child from getting bored. The Gobbi is a beautiful mobile comprised of spheres in graduated shades of one colour to stimulate the visual sense. The spheres are light so that they move in the breeze. We purchased our Gobbi from Goose Designs. I have seen them made in a range of colours so I guess you could get one to coordinate with your child's room. Soon we will be introducing mobiles for batting and grasping and materials for the hand. Please remember that I love your input, please always feel free to leave comments, relevant links or email me. I have mentioned the purpose of the wall mirror previously here but never before have I been so aware of the importance of children observing movement. Montessori believed (as do many) that children need to observe a movement (absorb it visually) before they can execute the movement themselves. Then the child can repeat the movement to master it. This is as important for a three year old as it is for a 2 month old. For Caspar (3yrs) this means him observing me as I grip the pencil, as I hold a fork or a spoon. It is not enough to tell or instruct him what to do or how to do it. It is not enough to try and manipulate his little fingers around the pencil. He needs to see it and be around it. Not necessarily for me to give him a lesson but to ensure he has lots of opportunity during everyday life to see me write, to see me eat. The same for Otis (2months), while he is at a very unique stage developmentally he needs to observe visually his own movements to gain an awareness of them before he can then reproduce or master them. For him this is looking at his hands as he moves them opens and closes them or watching his own movements in the mirror with his aim being to master coordinated movement. This is in part what Montessori meant when she wrote about children absorbing their environment. It is important that as parents we provide an environment that is enriched with lots of opportunity. By this I mean ensure your child has the opportunity to observe you in your every day life, and for the youngest of children give them the opportunity to observe themselves.